From all the scientific inventions of the early modern era – 16th to 18th century – few have survived the onslaught of technical progress brought about by the next two centuries; among them you count the encyclopedia, rational philosophy and the concept of history. It is then no wonder that the three are closely interrelated.History as a category of human existence is of course older than that and perhaps as old as human culture, but the way we think about history and write it down, has been significantly altered in the course of the modern age. What is it that distinguishes our contemporary idea from both the remembrance of extraordinary deeds of the Greeks and the Jewish-Christian idea of a linear history that ends in salvation? Before answering the question, it is necessary to remark that the Greeks knew no concept of history – or for that matter of time or beginning – and what they practiced was historiography; furthermore, the Jewish-Christian idea was born out of the Hebrew bible and later amalgamated with neo-Platonic philosophy to emerge as the telos – or final destiny of mankind – which dominated Western thought until the 20th century. The crucial aspect however is that our contemporary concept was born in the age of scientific revolutions in which the humanities were struggling to meet the challenge of “objectivity” posed by the natural sciences. Mathematics and physics dismissed the value of history and philology as “literature”. But history – and the sciences born with this new concept: sociology, archaeology, ethnology – fought back with the rigorous standards reserved for the study ofnature. Hannah Arendt writes: “In the modern age history emerged as something it had never been before. It was no longer composed of the deeds and sufferings of men, and it no longer told the story of events affecting the lives of men; it became a man-made process, the only all-comprehending process which owes its existence exclusively to the human race.” History as a process was now embedded in the paradox of science: By the problem of induction, it is logically possible to falsify the observations of science. According to Karl Popper, an un-falsifiable theory is unscientific and nothing short of pseudo-science. History is then falsifiable. This paradox would bear unprecedented consequences for historical consciousness. False history is not necessarily a question of facts, but of the plurality of possible sequences, arrangements and narratives associated with the loss of linearity. The arrival of sophisticated technologies that replaced traditional encyclopedias and historiography makes it even more difficult to separate the experience of history from other forms of discourse: advertising, ideology, propaganda. It was Baudrillard who claimed that the nature of images generated by mass-media in the era of hyper-realities obscures the relation between images and their referent – the supposed real, giving way to a reference principle which hardly exists. Contemporary art has not been immune to the problematic referential frame at work between modern historical consciousness and the deliberate profusion of media images. Cinema for example was one of the favorite platforms for fascist and totalitarian aesthetics to shape and re-shape national histories. A singular project presented during Frieze Art Fair in 2012 by Turkish artist Aslı Çavuşoğlu, introduced the audience to an experiment in the transformation and distortion of historical facts through an ambitious, albeit shocking intervention: “Murder in Three Acts” was staged as a real-time performance, executed in the manner of televised crime dramas with a crew of professional actors, solving the riddles of a crime, following meticulous forensic procedures. 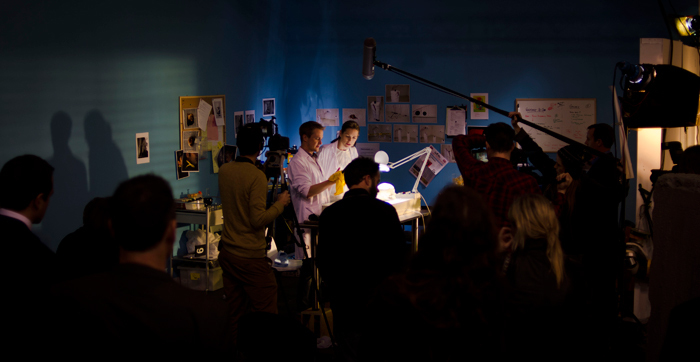 The performance was on view to the visitors of the fair – and the resulting footage, screened the following day while the performance continued – adjoined by a separate space in which the artworks involved in the investigation of the crime and examined in the performance as evidence, were on show. Çavuşoğlu is shedding light on a number of aspects related to the narrativity and epistemology of history: The authority of expertise – and connoisseurship in the case of art – legitimizes the objective reality of a history, whose told story remains unknown. The precision involved in the forensic procedures turns a scripted situation into an object of study, process out of which it acquires its reality, regardless of the facts being fictional or not. The artist takes cue from detective stories and crime dramas in a sustained critical engagement with the correlation between truth and fact in a social setting: Crime-solving is one of the strongest metaphors for truth-seeking in the absence of a hierarchical model of information. Monopolies of truth in historical research become not only objective methodologies but also general principles out of which all future history – of the event – is to be read; making the informed observation that the past is transformed by the ethics and aesthetics of the present, a lot more than by the mere distortion of remembrance. Her intervention is not only aesthetic and performative but also analytical: A work of art that researches itself as it is on process. Unlike a great deal of process art that embraces ephemerality as the strong aesthetic assessment, Çavuşoğlu’s work produces quantifiable results that are available for further study of the impact of her practice. The notion of historical transformations is not new in her work. One of her most interesting interventions, because it overlaps with the public space, is the project “Dominance of Shadow” (2004) that in a similar vein, is produced by renting billboards in Istanbul in order to place posters of a fictitious film. The artist is here researching relations of power connected to knowledge in the public space and how they actually shape the margin of the real because of their status in the hierarchy of discourse, more than by any validity. In her video project “Different Estimations Little Moscow” (2011), Çavuşoğlu researches materially the Fatsa incident known as “Point Operation,” a trial held on September 12th 1980 against a participatory democratic experience in the town of Fatsa, part of the turbulent politics of the military regime that held power in Turkeyafter the coup d’état. She questions the short-term and fragmentary memory of Turkey, through presenting traces that stand for little known history: Fragments, material objects, empty spaces. During the operation, thousands were arrested, persecuted and dozens killed. The traces of the story were researched not based on primary sources but on the knowledge accumulated by the younger generation about the incident, which at best, was partial. The narrative format of the documentary is replaced by a visual essay, somewhat lyrical, somewhat epic, in which the silence surrounding a troubled past and the absence of material traces stand as a witness of memory on their own. Collective amnesia (partial or not) does not help in enacting the past, but it does stand firmly as a symptom that the past has not been closed off by the sheerness of the present. Overall, Çavuşoğlu conducts her research as a skilled social scientist who is constantly re-staging and re-arranging events into different spatial topologies that appear somewhat archival and final but yet are only riddled with more and more questions. The performance of science as production of art offers a strong criticism of the induction principle and scientific falsifiability. In “Murder in Three Acts”, perhaps her most ambitious project to date, the artist is unleashing a fictional imaginary about categories central to experience: assessments, judgments, criteria. Çavuşoğlu’s work unfolds an archaeology of the present tense, through excavations that unearth unpredictable certainties, often taken for the granted, and exposed here not as lies, but as risks, probabilities, possibilities. The choice of staging this work at an art fair, where actual works of art are circulating is an interaction with the viewer of contemporary art that hardly reaches the gallery format. Oscillating somewhere between theatrical and documentary, the performance feeds – omnivorously – on the spectacle of art, subverting the limit between process and finished object. It would be a mistake to call it an experimental artwork, because it derives a lot of its conceptual strength from a sense of irony about science and experiments overall. The artist’s next project is apparently concerned with archaeology in Turkey, where the imbalance between secular and religious governments over the past few decades has changed the consciousness of the origin and past on the basis of current political demands presented as realities. The artist aims to fictionalize archaeology through the remoteness of a constant imaginary that is yet always in flux. Aslı Çavuşoğlu's work manifests a permanent anxiety over the reasons for history, when everything we have is but our lived experience. “Murder in Three Acts” was on show at Galeri NON, Istanbul, between March 1stand April 23rd, 2013.